If you are feeling adventurous and brave, sky diving in Missouri is something that you need to consider. Take a leap of faith and look into one of these Missouri sky diving locations. Have fun and try something not many will try! The wind screaming past your body is an unbelievable experience of freedom. Feel the warmth of the blue sky and release your fear of danger! Skydive Missouri River Valley Skydivers (MRVS) have world record skydivers! Skydive MRVS has a good climate, control, manifest, waiting area, shower, picnic table, concession stand as well as pop and candy machine, service rigging loft, swing set and more at reasonable prices. Static line (first jump course, training, gear rental and first jump) $159. 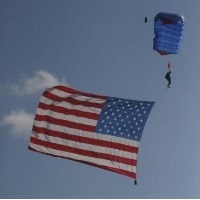 Additional Static Line Jumps $55, advance training class $70, each AFP jump at all levels $70 and Tandem Jump $199. You must 18 years old and no more than 220 lbs. as well as in reasonable physical health to jump. Awesome and the most exciting experience of your life! Flight Providers offers an amazing experience of skydiving; skydiving, tandem skydiving, qualification for a basic skydiver license, advanced skydiving courses, tandem instructor course. Tandem skydive is a pleasurable introduction to all aspects of skydiving, designed to reduce stress and keep anxiety to a minimum. Skydive Missouri also offers upon completing 2 to 3 tandem skydive levels, Accelerated Free Fall Training (AFT) which is your next step to becoming an experienced skydiver. Jump now and experience the free fall at very reasonable prices; tandem skydive $209, 1st solo jump $99, photos/videos of the experience vary between $99-124 additional, still photography $70. Jump now to have an awesome experience in your life. If you have ever been to St. Louis there are many fun things to do, going to Gateway of Arch, Cardinals Games, spending a night out. But the most fun and extreme thing to do in MO is skydiving here at Skydive Flying V Ranch. People who have not tried skydiving have a lot of misconception or "myth" about sports. Skydive Flying Ranch is a bit nerve racking, but there is perhaps no athletic activity that intimidates beginners quite as much as skydiving. Experience the great, memorable jump at affordable prices. 17,000 feet tandem skydive with 75 seconds of freefall at $349 is the highest jump in MO. 13,000 ft trandem skydive with 55 seconds of freefall is $269. 10,500 feet, 40 seconds of free fall is $249. Additional DVD edited in slow motion and music of your skydive is $85. 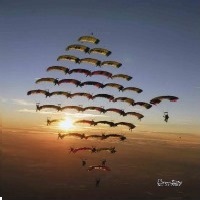 CD unedited of your skydive $95. 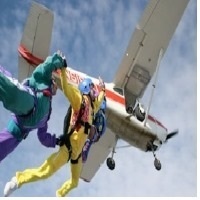 GO BIG PACKAGE 17,000 foot tandem skydive DVD slow motion and music of your skydive is $429. Weight limit is 200 pounds and you should have appropriate height-weight ratio. Thirsty for Adventure? Nothing satisfies like Skydiving! Rapid Descent Skydiving is the place to go for affordable skydiving in MO. What are you waiting for? Fly and jump now! Rapid Descent Skydiving is operated by Baron Aviation Private Flight Service, a sister company of Baron Aviation LLC founded in 1997. Baron Aviation is located in Perry MO and has a long and rich history in restoration of classic aircraft including the Cessna 195 and Twin beach 18 series. Many of these restorations got numerous awards nationwide. Including the prestigious awards at EAA's air Air Venture in Oshkosh, Wisconsin. After a couple of years these aircrafts were being flown and fewer people were getting a chance to see, hear and ride in these classics. Their services include aircraft maintenance and rental, flight instruction, glider operation and aircraft chapter. So much excitement so far in Hannibal for a safe and fun drop zone. Skydiving is the gift that's never forgotten! Experience the extreme thrill while you are flying like a bird. Why don't you give it a try? Ozarks Skydive Center carries on the long tradition of high quality training, safety and fun necessary to skydive in the mid-west. They only use state of the art equipment and your safety is their number one priority. Whether you choose any jump you want like tandem, IAD, AFF or work with their coaches to develop your skills to learn something new like training of tandem or other instructional rating, they are sure you will experience the finest instruction and care at MO Ozark Skydive Center. They are not just amazing quality of skydivers but also quality of skydiving instructors.